Ali, a hashish farmer stands in his field of hashish, which he will harvest at the end of October and process into cannabis resin. Lebanon's anti-drug squad and the handful of soldiers protecting them had an unpleasant surprise last month when they launched an annual raid on fields of ripe hashish in the northern Bekaa Valley. Rather than standing aside meekly while their hashish was ploughed up as in the past, the farmers this year were determined to protect their lucrative crops. "They shot at us with automatic weapons from nearby woods and houses," Colonel Adel Machmouchi, head of Lebanon's Drug Enforcement Bureau, told TIME. "RPGs [rocket-propelled grenades] were exploding above our heads and we had to leave." Taking advantage of a debilitating political crisis in Beirut, overstretched security forces and a lifeless economy, the Bekaa farmers this year have cultivated the largest hashish harvest since the war-torn 1980s when this fertile valley was awash with drug crops. Lebanese police estimate that some 16,000 acres (6,500 hectares) of hashish and a small amount of opium poppies were planted this year on the sun-baked plain of the northern Bekaa. "Lebanese hashish is the best in the world, better than Turkey and Afghanistan," says Ali, a Bekaa farmer standing in his field of knee-high hashish plants, the spiky saw-toothed cannabis leaves swaying gently in the hot breeze. Ali and other hashish farmers interviewed by TIME requested their real names not be printed. Ali said that he expects to produce 15 kilograms (33 pounds) of cannabis resin from his eight dunam (9,568 square yards) field, which he will sell for around $10,000 to local drug dealers. "Usually, we sell hashish for about $1,000 per kilogram, but there was so much hashish grown this year that prices will drop a little," he says. Still, with two harvests since March, Ali's income this year from hashish growing is $20,000, a big sum for this impoverished area. 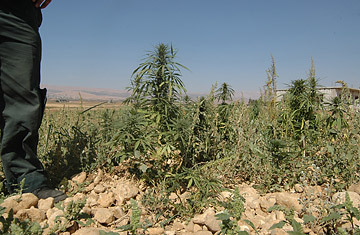 Long grown in the fertile Bekaa, cultivation of the cannabis sativa plant peaked during Lebanon's 1975-1990 civil war when the northern half of the valley was carpeted in hashish and opium poppies, turning simple farmers into multi-millionaire drug barons. In the early 1990s, the Lebanese government and the United Nations Development Program launched an initiative to replace drug crops with legitimate alternatives. The UNDP estimated some $300 million was required for rural development of the Bekaa. Lebanon was removed from the U.S. government's list of major drug producing countries in 1997. Despite that delisting, the promises of international funds never materialized and the program was dropped in 2001. Most years since, the ripening hashish crops are destroyed shortly before the harvest by drug police protected by hundreds of Lebanese troops. But this year, the Lebanese army's manpower was stretched to the limit with security commitments in Beirut, along the southern border with Israel, the eastern border with Syria and in the north of the country where troops fought a bloody three-month battle against Islamist militants during the summer hashish growing season. Furthermore, the hashish farmers threatened to burn down the houses of local tractor owners who are hired each year by the government to plough up the illegal crops. After Colonel Machmouchi and his men were shot at by heavily armed fighters, the annual hashish eradication program was abandoned for fear of provoking a popular uprising against the government. But the farmers say that this year's successful harvest is only the beginning. "We are tired of being hungry. We view the government as an enemy and from now on we are going to grow hashish and we don't care what the government says or tries to do," said Ahmad, a hashish farmer. It is an argument that fails to win the sympathy of Lebanon's drug police. "Does poverty in Lebanon only exist in the Bekaa?" asks Colonel Machmouchi. "No, but it's the only area growing hashish." The problem, he added, is that the farmers of the Bekaa are so accustomed to growing hashish that they no longer consider the practice a crime. "The solution is to change their culture, but that will take years," he said. Indeed the culture still celebrates people like Jamal Hamieh, a down-to-earth but shrewd farmer from Taraya village. Protected by a private army drawn from the Hamieh clan, he hosted Mafia dons, Colombian drug lords and New York gangsters, and threw lavish parties for top Syrian military intelligence officers based in the Bekaa, plying them with whisky, women and thick wads of $100 bills. Hamieh received expensive presents in return from his grateful clients. One gift was a brand-new Porsche which Hamieh, unaware of the car's status value, blithely destroyed in a matter of days by driving it over rugged dirt tracks to visit his poppy fields. He has the dubious honor of being the only Lebanese on the U.S. Treasury Department's list of international narcotics "kingpins." Although Hamieh says he retired years ago, he still occasionally receives foreign drug traffickers hoping to entice him back to his old ways. "The police are always watching me, but I can't help it if foreign dealers come and visit me," he says. Lebanon's maritime and land borders are also under close observation since last year's war between Israel and the militant Shi'ite Hizballah organization, mainly to prevent arms being smuggled into the country. That makes it harder for drugs to be whisked out of Lebanon  which creates a looming local problem. With cannabis having a shelf life of about two years, most dealers plan to sell their products in the domestic market. Recreational drug use is on the rise in Lebanon. "The problem is that drugs are readily available and relatively cheap," says Brigitte Khoury, a clinical psychologist and professor at the American University of Beirut. A problem that will only worsen if the Bekaa farmers return to their old ways.